Timgad, called Thamugas by the Romans, was a Roman colonial town in North Africa noteworthy for being one of the best extant examples of the grid plan as used in Roman city planning. It was founded by the Emperor Trajan around 100 AD. streets: decumanus maximus and cardo, lined by a partially-restored Corinthian colonnade. On the morning of April 16,1928, my mother and I were among the very few--and silent few as I recall-- standing among the melancholy ruins of Timgad. I also visited the Bardo museum with its magnificent collection of mosaics. I believe it is now closed. With 3 of Algeria’s 7 sites being “Roman ruins” it is perhaps too easy to slide into the “just another ruined city” syndrome if Timgad isn’t your first. Yet each is different from the other and the value to be gained from visiting each comes from teasing out their differences rather than from identifying their similarities! Mind you – we visited 2 other non-UNESCO Roman sites, so we were reaching our limit! Timgad’s “speciality” lies on the fact that it was built in 100 AD (at the behest of Trajan) “ex nihilo”, as UNESCO call it, i.e on empty land where no town/city had ever existed before and prospered greatly over the next 200 years in what seems to have been a cultured and peaceful existance. As such it represents a Roman “ideal city” as far as town planning was concerned – unconstrained by earlier layouts and also, given the relatively flat open site, by geographical limitations. Originally it was of a perfect grid pattern within a near square (though later developments went outside and didn’t entirely follow this). There are theories regarding the orientation of Roman grid towns based on astronomic calculations regarding sunrise on the day of foundation or on the birthday of the founder (Romans had “founding ceremonies” based apparently on earlier Etruscan and possibly Greek ones). This may explain why the main road out of Timgad to/from the nearby Military camp of Lambaesis, sets off at a definite angle to the main axes rather than those axes being determined by it. Despite what I have said above about “Roman ruin fatigue”, it is probably worth taking in Lambaesis since you will pass it anyway 25 kms before Timgad if you are traveling from Batna. Its significance in relation to Timgad lies in the fact that the latter was apparently conceived of as a settlement for ex-soldiers from there (together of course with their families) and much of the central area consists of medium sized villas of standard size – rather like a modern housing estate! 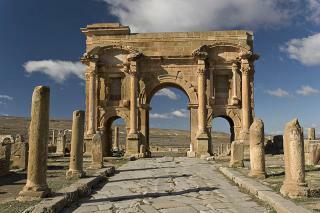 To live in Timgad you had to be a Roman citizen – and you could become one if you served in the army for 25 years. So such “offers” were a good way of integrating conquered peoples, and it appears that they would have had a pretty good life here. There is a famous piece of hedonistic graffiti in the Forum which translates as “To hunt, bathe, play games and laugh. This is life!” (except that it has a spelling mistake – which reminded me very much of the Centurion’s Latin lesson to the hapless anti-hero in the “Life of Brian”!!). In addition to a 3500 seat theatre, many baths, a fine public latrine, a pleasant colonnaded street with shops and a market whose stalls are carved with representations of the abundant produce on offer (The area was far more fertile than it is today) there are also a “bar” (with engraved vine branches) and a well signposted brothel (with an engraved phallus. Photo)! Of particular note is the public library with the benefactor’s inscription still present (“Ex liberalitate M. Iuli(i) Quintiani Flavi(i) Rogatiani”) – and the amount he paid! Known as the Rogatinus Library, the niches for storing over 6000 “rolls” are clearly visible. It is, apparently, one of only 2 libararies ever discovered in Roman provincial cities (The other is at Ephesus). Indeed, another aspect of the site is the large number of inscriptions which identify individual owners of houses, often using nicknames, and throwing much light on the social life of the population – though you need a guide to bring this out during a visit and my comment in my review on Tipasa about getting the little guide book (ISBN978-9947-979-04-4) wherever you see it, rather than waiting until you get to the site applies here too! a. The development of a Folk/Music Festival using the Roman theatre incurred UNESCO’s displeasure in the periodic review of 2000. Surprisingly quickly (for Algeria), money was found to build a pseudo-Roman theatre (in concrete) only just outside the inscribed boundary (which has also caused criticism!). Construction started in 2006 and the Festival was transferred there in 2010.
b. The museum, which like those at the other Algerian Roman sites contains fine mosaics, has been closed for years (A 2006 report states that it had already been “fermé depuis plus de dix ans pour cause de pillage et degredation”!!). We were told that, just occasionally, it is possible for foreign visitors to gain entrance “as a special favour” - but we were unable to. c. The desertification of the area since Roman times has, since the excavations removed protective coverings, led to erosion gullies, removal of stones etc. Whilst, in the open landscape, the growth of the rather ugly town of Timgad close to the boundaries is irrevocably bringing the outside world in view when visiting the site. One of my favorite travel reference books is “The Travellers’ Dictionary of Quotation”. It records, under Timgad, a 1928 quote from Hilaire Belloc - “Timgad impresses me more powerfully with the past than any other place I know”. This is perhaps a bit OTT, but the central area does provide a good opportunity to try to imagine/understand what daily urban Roman life might have been like. It was a great shame however that the mosaics in the museum are not on view –from the guide book mentioned above they look magnificent!! I visited Timgad in the summer of 1975, it was more remarkable because I was not expecting this visage in the desert. I had been working in Algeria, and travelled extensively in the littoral country knowing it very well. I had a had visited Tunisia to renew my visa and on a whim decided to take a round about route Constantine to Biskra and Bou Saada and back to Blida. It was the end of a hot summers North african day when Timgad came into sight. I was spell bound and absolutely awestruck by the ruins shimmering in the saturant setting sun. To such an extent that nearly 30 years later I am still awestruck. Historical Graffiti: A Latin inscription, with a typographical error, chiseled into the stone steps surrounding the Forum square reads: “To hunt, bathe, play [games or gambling? ], to laugh. That is life!". 19 Community Members have visited.